Being able to hear and identify beginning sounds in words is a crucial pre-reading skill. Learning how to isolate and manipulate sounds is an important building block to learning to read. 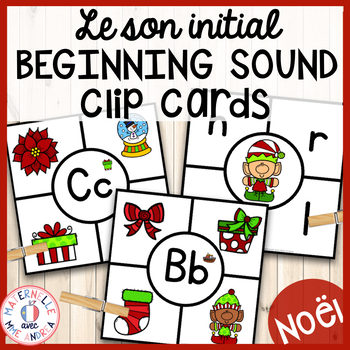 Our students need as much practice as possible isolating and identifying beginning sounds, so that they can develop their "conscience phonologique" skills and become strong readers! I find the best way to help my students master beginning sounds is to have them practice, practice, practice! We play a variety of games to help us get better and better at listening for and identifying les sons initiaux. 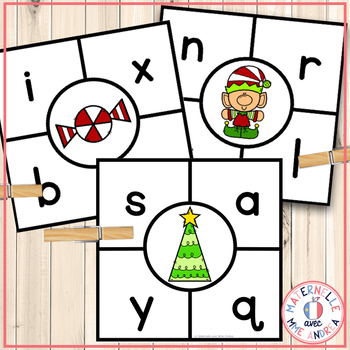 Use these clip cards during your literacy centres and give your students valuable and engaging practice identifying the beginning sounds in a variety of Christmas-themed words. To prepare the cards, simply print, laminate, and cut. To make them self correcting, you may want to put a sticker on the back, behind the correct answer. Provide your students with clothespins (*not included), and model how to say the letter sound OR beginning sound of the object in the middle of the card, and correctly clip the match. Simple, but fun and effective! All cards are SQUARES, for easy cutting! There are 25 cards with an object in the middle of the card. Students will say the name of the object, and clip the letter that makes the beginning sound. 27 cards have a letter in the middle of the card, and pictures of objects on the sides. 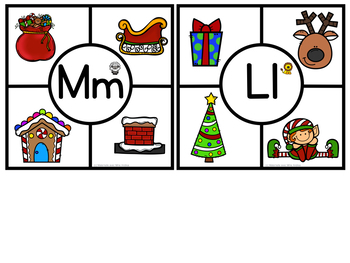 Students will make the letter sound, say the names of the objects, and clip the word that begins with that letter. Check out the preview above for a closer look, and to see the included words/letters! Looking for more clip cards? CLICK HERE! Don't forget to click the green star by my name to Follow Me and be among the first to find out when new products and Freebies are added to my store! I would also love if you left me some Feedback, by going to your My Purchases page and clicking Provide Feedback. This gets you credit you can apply towards future purchases!